Two things in life we like: faster processors and lower prices. Today, Apple has given us both along it’s Retina MacBook Pro line. That’s right, with today’s announcement, the 13-inch Retina MacBook Pro now starts at $1,499 with 128GB of storage and $1,699 for the 256GB model with a new 2.6 GHz processor. The entry-level 15-inch model now includes a faster 2.4 GHz quad-core processor and the high-end model now has a 2.7 GHz quad-core processor and 16GB of RAM. 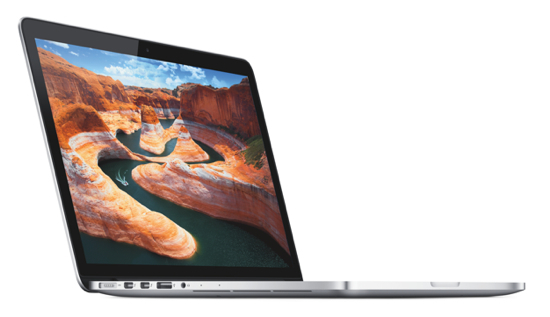 In addition, the company also cut the base price of the MacBook Air with a 256GB SSD to $1,399. Apple’s full press release is after the break. As was expected, today Apple updated its lineup of portable Macs with all-new MacBook Pro computers of various sizes and specifications. Although the updates are more evolutionary than revolutionary, that doesn’t mean they aren’t significant. Some of the new updates include i5 or i7 “Sandy Bridge” processors across the lineup, AMD Radeon HD Graphics, Thunderbolt connector and all of the version have a larger trackpad, have dropped in weight and feature a new “Facetime HD” camera instead of the former iSight camera. • FaceTime HD camera, 8X slot-loading SuperDrive, Thunderbolt High-Speed E/A and Mini-DisplayPort, 802.11N WiFi, Bluetooth 2.1+EDR, SDXC, FireWire 800, USB 2.0. Like it is when pretty much anything new is released by Apple, their online Apple Store was down for a bit this morning. Now, the store is back and with it are new, improved MacBook Pro models for your purchasing pleasure. These updates were rumored to come for the last months and now they have and provide an impressive array of new features and models from which to choose. The 15″ and 17″ models now use the i5 and i7 Intel dual-core processors (at 2.4, 2.53GHz or 2.66Ghz, respectively), giving them a big performance boost and permitting hyperthreading (up to 4 virtual cores). They also include the GeForce GT 330M graphics chip, and the NVIDIA-driven Optimus technology to switch from the high-end video subsystem to integrated graphics on the fly to improve power management. Users of previous generation MacBook Pros will remember that this process used to involve logging out and in to switch, but now simply requires the click of a mouse. The improved power handling lets the 15″ and 17″ models supposedly go 8-9 hours on one battery charge. That, of course, remains to be seen. In addition, all models now include 4GB of RAM standard. Unfortunately, at least according to the buzz over at Apple’s support discussion forums, it seems there’s somewhat of a pattern where brand new Quad Core i7 iMacs are showing up DOA or with a cracked screen, mostly in the lower left corner. As if waiting weeks to receive a custom ordered Core i7 iMac wasn’t bad enough, now you have to deal with these issues as well. It just doesn’t seem fair. Still, anyone buying a first generation product as advanced as the Quad Core i7 iMac should be aware that these types of cutting edge products can have issues. The first model of anything is usually not the one you want to go out and get. That is, unless you like to be a de facto “Beta Tester’ for the product. Some around the Internets have speculated that the packaging might be inadequate for the giant 27″ computers and the bumpy journey from China to the USA is what’s causing the screen cracking issue, but one would like to think that Apple wouldn’t make such an amateur mistake, especially given their penchant for innovative and thoroughly reliable packaging. Fortunately, according to reports, Apple is taking care of customers in these situations but it is a bit of a bummer after watiting several weeks or months for a new iMac, only to have it need to go in for service. With the holiday season upon us, its also not a great time for Apple to be shipping products with problems. Still, given their track record with sales and their ever increasing share of the marketplace, this one little (or two little) issue probably won’t have much of an effect on their bottom line. In short, I think Apple is gonna be just fine.